Most of us take pride in designing e-learning courses that give our learners some freedom to explore. But there are times when we need to exert a little control over how they interact with training content. For example, compliance training often needs to be consumed by learners in a specific order, to ensure they don’t miss important information. And try as we might, the requirement that all content must be viewed, in order, is sometimes a necessity for your organization to meet its legal or regulatory requirements. Thankfully, Articulate Presenter ’13 gives you plenty of options for controlling slide navigation behavior. 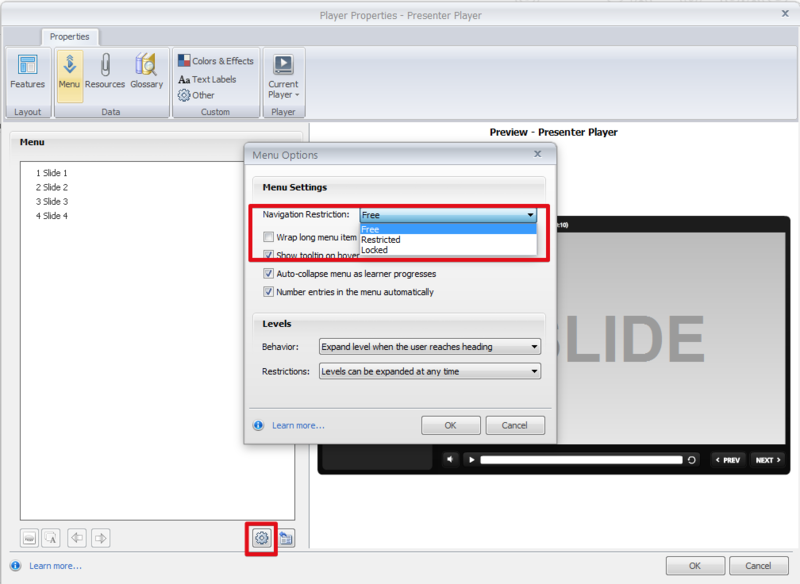 To access the slide-level options, click on the Slide Properties tab on the Articulate ribbon. From here, you can control slide branching, the visibility of the course player controls (Prev and Next buttons), how slides are advanced (auto or by user), how the slide is navigated (free or locked), and other slide properties. Let’s take a closer look at each of these options—along with a few pro tips for choosing the right approach for your project. Select a slide thumbnail and then click on the Branching hyperlinks in the Properties panel. Then, choose the slide you want to branch to from the drop-down menu. Another way to control navigation is to flat-out hide the Next and Previous buttons. You can do this on a slide-by-slide basis or for all slides. Hiding the default navigation buttons gives you the flexibility to create custom navigation using hyperlinked button shapes, text, or images, or to keep learners from clicking the Next button to skip past slide content like audio narration or animations. First, click on the Controls hyperlink (to the right of the slide thumbnail image in Slide Properties) and then uncheck the Prev and Next button boxes accordingly. Another way to do this is to select the slide you want to change, and then uncheck the Prev and Next button checkboxes under branching, as seen below. All slides: Use Ctrl+A to select all of the slides, then uncheck one or both boxes in the Properties panel, under Branching. Consecutive slides: Select the first slide and then hold down the Shift key on your keyboard and click the last slide. This should automatically select all of the consecutive slides in between. 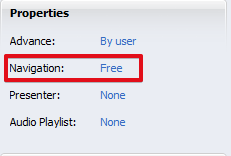 Simply uncheck one or both boxes in the Properties panel, under Branching. Nonconsecutive slides: Select the first slide and then hold down the Ctrl key on your keyboard and click the other slides to select them. 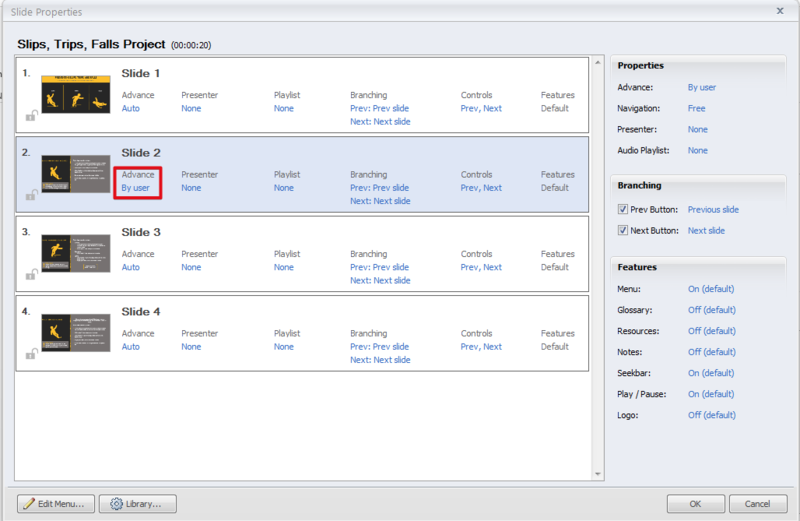 With the chosen slides selection, just uncheck one or both boxes in the the Properties panel, under Branching. By default, Presenter ’13 sets slides to advance automatically upon completion of any media on that slide. In other words, slide duration is determined by the slide’s audio, video, or animations. 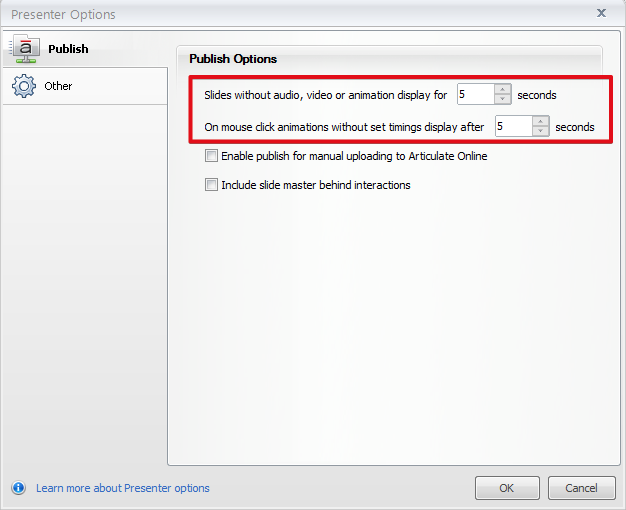 While that is the default behavior, you can specify timing by clicking on Options on the Articulate Tools ribbon. If you want to learn more about Publish Options, check out this handy how-to article. To change the default slide advance setting from automatic to “by user,” simply click the Advance hyperlink. This hyperlink is a toggle with only two settings: auto or by user, so if you change your mind, just click the hyperlink again to change it. Pro Tip: You can change the advance settings on multiple slides following the same basic tips we reviewed above to select all, consecutive, or nonconsecutive slides. Then, click the Advance hyperlink in the Properties panel to apply your chosen setting to the selected slides. Concerned that your learners will be confused if the Prev or Next buttons aren’t there? By default, Presenter ’13 lets learners navigate slides freely, but you also have the option to lock the player controls for a slide (or slides) or for the entire course. This leaves the controls in place on the course player, but deactivates them for certain slides or the entire course if you choose. Click the lock icon just to the left of the slide thumbnail image in the Slide Properties panel. Now you’ve locked that slide. You can also toggle between free and locked navigation by clicking on the hyperlink next to Navigation in the Properties panel. You can also follow the Pro Tips we covered, above, for selecting multiple slides at once, and then change the Navigation setting in the Properties panel. Building a linear course and want learners to move through it in a defined order, from beginning to end? You can implement this behavior by restricting or locking down navigation for your entire course. Here's the low-down on how to access this setting—and how to decide which navigation method to choose for your project. On the Properties panel, click the gear icon at the bottom right of the Menu tab. When the Menu Settings window appears, click on the Navigation Restriction drop-down to choose from Free, Restricted, or Locked. 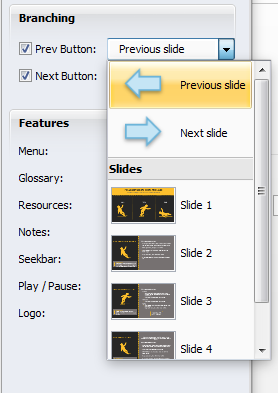 Click OK.
Free: Learners can click slide titles in the menu to navigate to any part of the course at any time. They can also view slides in any order, unless you’ve specified slide-level settings that restrict access. Restricted: Learners can view the current slide and any slide they viewed previously, but they can't use the menu to jump ahead or skip over slides. Locked: Learners can only view slides in the order you've designated. In other words, they can't use the menu to jump ahead or skip over slides, nor can they use it to go back to any previously viewed slides. Locking or restricting your course’s navigation means that learners must view each slide, in its entirety, all the way through before moving forward. These requirements may be a bit tedious and overly rigid for learners who are accustomed to more freedom in their e-learning. Ultimately, the needs of your project, your organization, and your learners should guide your decision about which options to choose. There are pros and cons with every option. Keep in mind that Presenter gives you the flexibility to control slide-level navigation behavior, so you may not need to make your entire course a linear, locked-down learning experience. 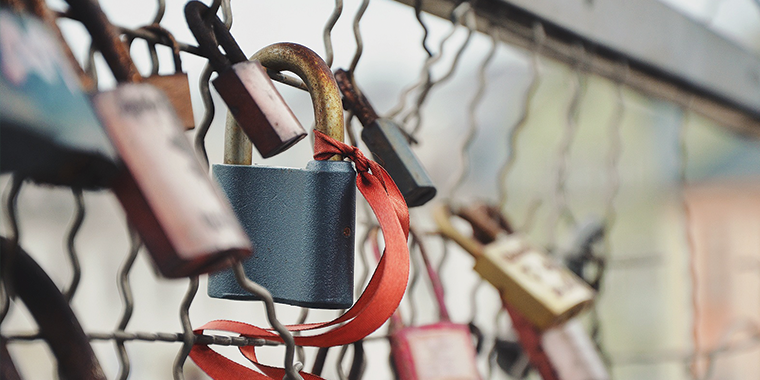 If possible, try to use locked or restricted navigation sparingly—just for the most critical information. Looking for more ideas or how-to tips for working with high-risk, high-profile training content? Be sure to check out these related articles. What design challenges does your e-learning present? Share your story in the comments below. And don’t forget to follow us on Twitter and come back to E-learning Heroes regularly for more helpful advice on everything related to e-learning. This is great! I especially like that Pro Tip as I did not realize you could select multiple slides at once in the Slide Properties window. One thing I would like to see in the Control options is for the first slide to automatically have "Prev" unchecked and the last slide to always have "Next" unchecked. This is something I do myself on every presentation I create, since it doesn't make sense to have a Prev button when there is nothing previous, and doesn't make sense to have a Next button when you are at the last slide. Thanks for the link Trina - I submitted the idea. I'd like the viewers to only click "next" to view the next slide (instead of the presentation automatically advancing). I have the navigation set to restricted, advance by user (I had it on locked originally but then they couldn't use any buttons- previous or next). However, I noticed they are now able to use the seek bar to skip to the end of a slide. We do not want this. Is the only option to remove the seek bar which then doesn't make it clear when the slide ends? Or am I missing something? Thanks! We purchased the Articulate Studio 13 Pro in March of 2014. Our organization provides on-line compliance training. Our students are not allowed to fast forward through the courses (i.e. at 2 hour course must be timed and not allow pre-advancement of slides). I have developed classes with Studio 13 for online course offerings but, I was not able to use the program because it doesn't provide a "timed" approach through the software that would make the "Next" button appear when the developer of the training deems necessary. There is a "work around" (like you mentioned in this blog) which required the developer (me) to install the timings and a "Next" and "Previous" button in the presentation itself and disable the "Next" button in articulate. The work around looks unprofessional as it is not part of the Articulate Player (not to mention a very time consuming process). Is there is a way to have the programmers at Articulate update Studio 13 to allow the developer of the training to control when the "Next" button will appear in the Articulate player and not require the developer to put it into the presentation? Thanks! Hi Dave. Articulate Studio doesn't offer the feature to control the course player next button depending on certain conditions being met by the learner (the amount of time spent on the slide or the learner completing everything on the screen, for instance). Has your organization checked out Storyline 360? Storyline does offer that feature and would allow the developer to disable the Next button on the course player until certain conditions are met. Dave, I'm really sorry to hear that Articulate Studio '13 didn't work out for you. I suggest you email our success team at success@articulate.com and let them know of your concerns. They should be able to walk you through your options.